Debi Joy Lampert: Potterypup Studios & Topaz Cockers - The Golden Age of Dog Shows: Morris & Essex Kennel Club 1927-1957 by Debra Lampert-Rudman * Foreword by William SecordClick Here & Read The AKC Gazette's review of The Golden Age of Dog Shows by Bud BocconeClick Here for William Secord's postingNominated for a 2016 Maxwell Award by the Dog Writers Association of America! Nominated for a 2016 Maxwell Award by the Dog Writers Association of America! SOMERSET, NJ - The limited edition, hardcover coffee table book, The Golden Age of Dog Shows: Morris & Essex Kennel Club 1927-1957, by Debra Lampert-Rudman, with Foreword by William Secord, is available now through the “Shop” on the Morris & Essex Kennel Club website www.morrisandessexkennelclub.com and will be available for sale at the upcoming Morris & Essex Kennel Club Dog Show on October 1, 2015 in Colonial Park, Somerset, NJ. A booksigning with Ms. Lampert-Rudman and Mr. Secord on the show grounds is anticipated. Authored by M&E Publicity Chair and Board Member, Debra Lampert-Rudman, The Golden Age of Dog Shows is being called “stunning”, “a treasure trove”, and “keepsake that belongs on every dog fancier’s shelf” in recent reviews. Highlighting many never-before-seen photos and stories directly from the scrapbooks, archives, and memorabilia compiled by Mrs. Geraldine Rockefeller Dodge at Giralda Farms, Mrs. Dodge’s Madison, New Jersey, estate, the 178-page book features gold braid binding and outstanding high-resolution reproduction rarely seen in photos and documents from these time periods. The M&E Dog Show, founded by Mrs. Geraldine Rockefeller Dodge, was considered one of the most illustrious showcases for purebred dogs in the United States and was held yearly on her estate’s polo fields in Madison, NJ from 1927 to 1957. In its heyday, the outdoor dog show had over 50,000 spectators and 4,000 entries with all the great show dogs of the day including Nornay Saddler, the Smooth Fox Terrier, Louis Murr’s Borzoi Vigow of Romanoff, and the great black Cocker Spaniel My Own Brucie, to name just a few, competing for Best in Show. All of these greats, and spectacular dog show highpoints, feature prominently throughout this book. “The Dog Fancier of the Century” chapter beautifully depicts Mrs. Dodge, “The First Lady of Giralda” and her life, in both photos and stories, from the years leading up to the creation of M&E and beyond. Each of the following chapters, 1920s, 1930s, 1940s, 1950s, overflow with magnificent photos, clippings, articles, telegrams, cartoons, and comprehensive captions plucked from the archives at Madison, NJ’s St Hubert’s Animal Welfare Center (originally known as St. Hubert’s Giralda when founded by Mrs. Dodge), Morris & Essex Kennel Club archives, and private collections. 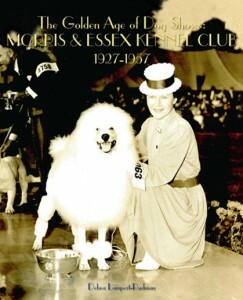 In the year 2000, the Morris & Essex Kennel Club was revived by Wayne Ferguson, Cherrybrook Pet Supplies founder and philanthropist, along with a small group of fanciers, in an effort to capture the “glory and grandeur” of the historically significant Morris & Essex show with a grand dog show to be held every five years. The Golden Age of Dog Shows rounds off with a chapter entitled “Morris & Essex Today” featuring lush Best in Show photos from the 2000, 2005, and 2010 “revival” shows, bequeathing the “Golden Age” to the next generations of dog fanciers.